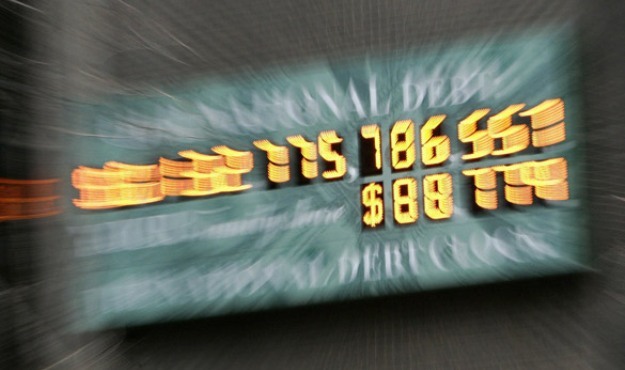 Are A Debt Crisis And Default Inevitable? The just-concluded three-part series about the endgame of the US debt crisis sparked more reaction than usual – not just from MLLG’s direct email recipients but also from readers of other blogs that routinely republish our posts. There remain skeptics, as well as those desperately clinging to hope, who aver a full blown crisis, albeit likely, is not foreordained. This blog post is for them. Note: The entire series is now available on our website: www.mllg.us. Virtually all the doubters and cynics base their thinking on a variant of a scenario whereby the US freezes spending for ten years combined with a concurrent robust 3.5% growth in GDP. Surely this will avert crisis and default; won’t it? The short answer is no. Those expressing skepticism (to my knowledge) have not seriously looked at the numbers. Even a decade of 3.5% GDP growth conjoined with a total spending freeze can’t work; here’s why. The US economy is no longer capable of sustained growth at 3.5%, which incidentally is above its long-term historic average. Coming off a severe recession, the economy grew only 1.7% in 2011; it should have been triple or quadruple that rate. History teaches once the Debt/GDP ratio exceeds 90% (ours does), GDP grows by 1 full percentage point less. The US will now be like Europe which is lucky to grow at 2.5%. We are in the early stage of a demographic time bomb that will continue for two decades or more. Medicare, Social Security and government pensions all are growing at 8% compounded. Medicare alone will increase from $750 billion to $1,400 billion by 2020. Interest on the debt will increase from $250 billion today to $1,000 billion by 2020 assuming a 5% interest rate equal to the long-term US average. This assumes freezing everything but entitlements. Bear in mind interest on the debt cannot be frozen. The political will to make even tiny cuts is lacking. The USPS is losing $16 billion a year and wanted to close 1,700 post offices; Congress refused to close even one. How can such a feckless government sustain deep cuts for 10 years and through 5 election cycles? If all spending except entitlements and interest was frozen, the spending in 2020 would be $5.5 trillion. If the economy grew at 3.5% (next to impossible), government revenue would be $4.0 trillion, leaving a deficit of $1.5 trillion equal to 7.5% of GDP. Finally, let’s consider the skeptics’ argument of 3.5% growth combined with a total freeze on everything including entitlements, excluding only interest on the debt which can’t be frozen except via default. Under that scenario the deficit in 2020 would still be $500 billion. And to achieve that miracle would require cumulative cuts to the future growth of Medicare, Medicaid, Social Security and government pensions that would amount to $1.1 trillion a year by 2020 – equal to a 33% cut for the recipients of those programs. To sum up, 10 years of high growth tied to a total spending freeze will not avert crisis because: (1) interest on the debt cannot be frozen; (2) interest rates will rise to at least their historic average; (3) the economy is incapable of 3.5% sustained growth; (4) the demographic time bomb is continuing to explode; (5) there is no political will; and, finally, (6) a lengthy freeze in defense would subject America to serious, untenable and possibly existential risks. Is There Any Conceivable Way to Avoid Crisis and Default? In theory it is possible but would require the US to take all (or virtually all) of the following actions by the middle of 2013, after inauguration of the new president and seating of the new Congress. Should Obama be reelected (50% probable) there is zero chance this will happen. Enact new permanent corporate and personal tax codes drastically shrinking all rates while eliminating deductions. This will stimulate growth and investment. Adopt pro-growth and pro-energy policies across the entire spectrum including throttling back existing regulations and a moratorium on new rules and regulations. Repeal ObamaCare and replace it with a plan that restores markets and real prices. Convert Medicare to a premium support plan and cut spending 30%. Block grant Medicaid to the states and slash spending 30%. Cut government employment (excluding military) by at least 10% and freeze new hiring for 5 years. Freeze salaries and benefits until they are equal to private sector jobs. Convert all government pensions to 401(k) type plans. Allocate all existing pension funds equitably to employees’ 401(k) accounts. Any unfunded or underfunded pension obligations are eliminated and employees take a haircut if necessary. The age for Social Security eligibility needs to be raised, the index formula changed and at least some privatization for younger workers should begin. Other government spending (except defense) needs to be cut and then frozen. All the above actions must be sustained for 10 years and through 5 election cycles. States and local governments should implement similar policies. Although I have disdain for nearly all politicians, they are not stupid and ignorant. If I and many others know there will be default, politicians also know this. This means only one of two things. They cynically conclude it is in their interest not to solve the problem, or they welcome a debt crisis and default as an opportunity to remake America into their version of Utopia. Obama likely is in this latter group; after all, no good crisis ever should go to waste. Given Obama’s extreme solipsism and narcissism, he sees this as his platinum opportunity to achieve eternal fame and glory by enacting a VAT and transforming America into a European style socialist welfare state. Never mind that Europe already has both higher taxes than the USA along with a 20% VAT and they still are going bankrupt.